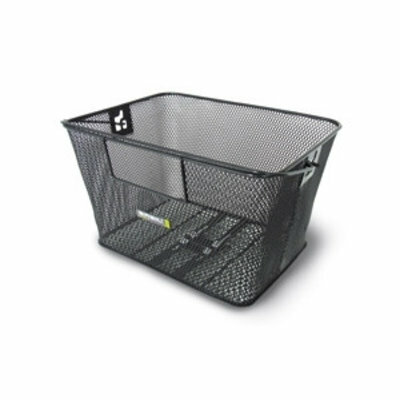 The Basil Concord XL is an incredibly practical bicycle basket with added height that fits to the rear of your bike on the luggage carrier. A popular choice for school students, busy commuters and recreational cyclists alike. In classic black, the Basil Concord XL Flex is designed to attach at the luggage carrier, while neutral colour makes it suitable for both male and female cyclists. This basket is extra high, easily removable and also comes equipped with a convenient handle for easy handling. This bike is particularly suited to students because of the satchel pouch it contains to house backpacks while you ride, although this user-friendly feature can be enjoyed by anyone. 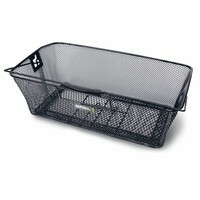 Furthermore, thanks to the handle, this basket can be relieved from the main frame and taken into stores to be used in lieu of a shopper or plastic carrier. 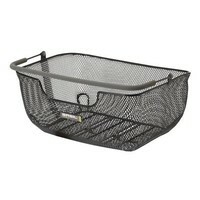 Made from fine-mesh steel for sturdiness, this basket features a cut-out for easy attachment with a spring clip. Measuring 40 x 30 x 24 cm, the Basil Concord XL Flex is large enough to house all your essential items and can be combined with various cycling accessories from Basil. 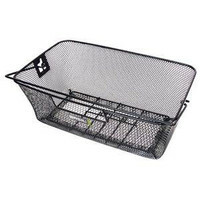 Browse our entire collection online to find more bike baskets, bags and other must-have add-ons to transform your bicycle. Practical design provides plenty of storage space. 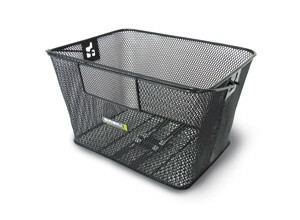 Removable basket for shopping and anti-theft precaution.